The contents of this page require the latest version of Adobe Flash Player. Isobekan is an old established household, whose members used to act as village headmen since ancient times, and an old established Japanese inn which began operations in the Edo Period. At that time, a thick bamboo grove covered the area, and the village people said the inn nestled into those surroundings was a vision of the "Sparrow's Inn" of Japanese fairy tales. A garden with atmosphere so quiet and beautiful, it will make you forget the passage of time. Enjoy the welcome of a harmonious natural space. Relax before an expansive view in our tranquil Japanese-style guest rooms. This refined inn draws people into serenity with the scent of wood, the murmur of the Usui River, and the sighs of bamboo swaying in the wind. Here you can encounter Japanese tradition, passed down for generations, and the true spirit of hospitality. In Gunma Prefecture, there are many hot spring areas, but the hot spring of this inn is unusual because it is a "salt spring" (rich in chlorides and hydrogen carbonate). It is known as the "finishing" hot spring – the hot spring to end your day's journey at. You can enjoy the changes of the four seasons at this hot spring located in the heart of a mountain valley. Positive effects General ailments, burns, cuts, chronic feminine ailments, etc. 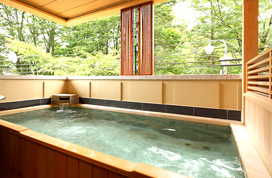 Isobe Onsen is regarded as the "finishing" hot spring of Gunma Prefecture. Relax and enjoy our baths together with the colors of the four seasons. *In the "Usui no Yu" you can enjoy a waterfall bath. *These baths are opened alternately to men and women. 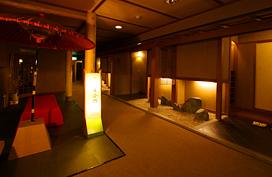 The Isobe Onsen has a long history. They say it began to flow more vigorously after the great eruption of Mt. Asama in 1783. This a sodium - chloride - hydrogen carbonate spring with good quality, and is said to be effective for all kinds of diseases. It was even acclaimed by Dr. Erwin Bälz from Germany. Isobe was originally a mineral spring with low temperature, but it was drilled out in 1996, and now hot water at a temperature of 52.6ﾟC gushes up at a rate of 150 liters per minute. At this inn, water from this natural hot spring is piped in from the source. Large garden bath "Usui no Yu"
Large garden bath "Toji no Yu"
You can enjoy an Isobe-style traditional multi-course Japanese dinner. The menu changes monthly. Our original gourmet Japanese cuisine, using local ingredients, is the ultimate in luxury. It will delight you with enchanting flavor. We serve original gourmet Japanese cuisine which focuses on flavors from the region. For breakfast, you can savor our local specialty, "Mineral Spring Tofu," which is popular for its warm, soft, melt-in-the-mouth consistency. In our private dining rooms, you can dine with even greater hospitality. We offer private dining rooms where you can leisurely enjoy your meal, while time slowly passes. *Dinner start time is between 18:00 and 19:30. *Private dining rooms require reservation. Please inquire for details. 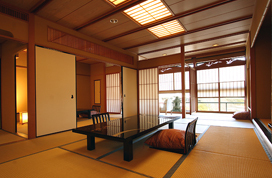 An expansive, comfortable Japanese space. 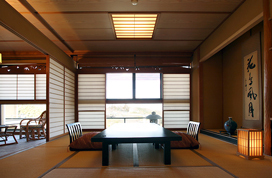 This room provides an even higher level of relaxation, with a cypress bath where you can enjoy the Isobe Onsen. 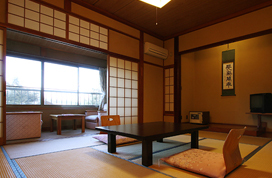 Japanese-style twin guest room with open-air bath. Each room has a cypress bath. Each room is equipped with a cypress bath where you can enjoy the scent of cypress while soaking in the bath. After going to the japanican.com site from the above banner, input the mandatory information according to the screen instructions. Please take care on your journey here. We await your arrival. From JR Shin-Etsu Isobe Station: 5min. on foot. From the Joshin-Etsu Expressway Matsuida-Myogi Interchange: 10min. Copyright 2010 Suzumeno-Oyado Isobekan All Rights Reserved.